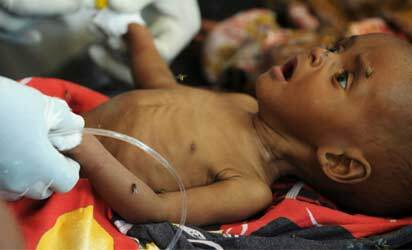 Welcome to Linda Ikeji's Blog: Let's put a stop to this now! Pledge and help save a life today. Let's put a stop to this now! Pledge and help save a life today. My little cousin, Daniel was sick, very sick, stooling uncontrollably – like 6 to 8 times a day. It was terrible watching him go through that everyday. He got only about 2 hours of sleep everyday. We took him to the hospital, ‘diarrhoea’ they said, just a couple of treatments and he will be fine but nothing seemed to be working. He continued crying almost all the time. Then he stopped eating, in fact, he cried at the sight of food. I think he was scared of eating. 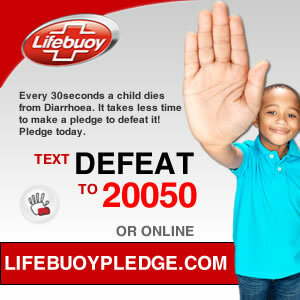 Lifebuoy will be making a donation to the cause of defeating Diarrhoea in Nigeria, all you have to do is take a pledge, join your voice to millions of others that want to put a stop to this plague. www.facebook.com/lifebuoysoap. Pledge now! Pledging closes on October 15th, the Global Hand Washing Day. Pledge and help save a life today. On behalf of Nigerian mothers. A truly commendable project. I urge us all to try and pledge on Facebook. You are not pledging a kobo,so don`t be scared *wink*. Pls just spread the word on FB, its quite easy to do. BTW i dont work for them, and i dont think i have heard of them till now, however their project is laudable and we shld all try and encourage them. Just one comment on this post?! dis is just bad.